Thousands of motorcycle racers and riders owe him their life but what inspired Lino Dainese to create his company in the first place? From race leathers to street textiles, knee-sliders to back protectors and air- bags, Dainese have been responsible for some of the greatest advances in rider safety over the last 46 years. 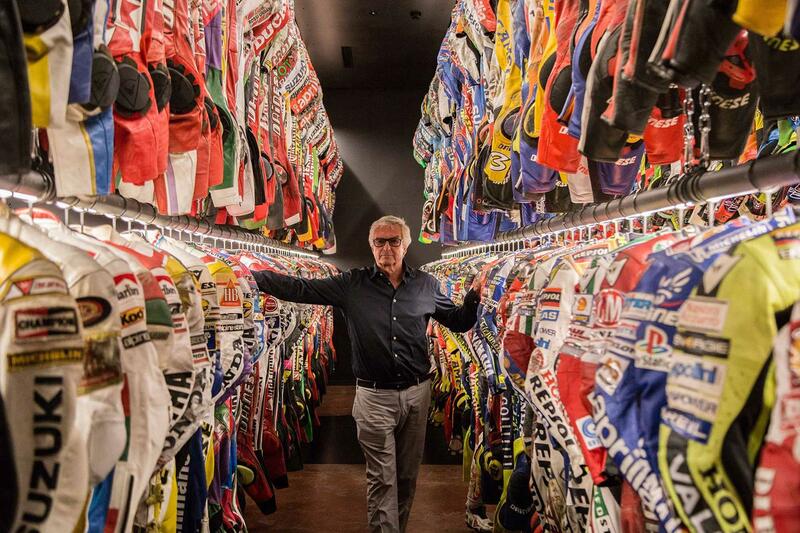 On the eve of the firm opening their doors to the public for the first time with their new Dainese museum, the man who founded the firm is talking to MCN about his incredible contribution to rider safety and what the future holds for protection. Lino Dainese, founder, inventor and brand driving force, had his genesis moment of genius on the streets of London. “The idea came to me during a trip on scooters with some friends. It was 1968, I was 20, and London seemed like the centre of the world with The Beatles and Carnaby Street. Everything was going on. All the bikes in Italy were small-capacity so London is where I first saw big bikes like Nortons, AJSs and Triumphs. “I was on my Vespa and a rider came roaring past on a big bike, all in black leather, and I knew then I wanted to be involved in motorcycling. So I bought a Bultaco Matador Mk IV, made my own leather trousers to go with it and that’s where everything started. “There weren’t many people making leathers back then. You had Lewis Leathers in the UK, Gaman in Italy, and Bates in America but Lewis and Gaman were very small so there wasn’t really a lot of competition. “I wanted to offer safety and a big range of colours because colour meant visibility. I also wanted to offer something new so paid great attention to quality. I found craftsmen who specialised in high quality leather, so the first success came from colours and quality. I started Dainese with an investment of about £2000. “Our first riders were Marco Lucchinelli, Roberto Gallina, Dieter Braun and Harald Bartol, but the first big name was Giacomo Agostini, although he was approaching the end of his career. “At that time, racers were asking for suits that weighed only 2kg so the leather was very thin and offered little protection. The first to ask for a safer suit was Agostini so we made one with thicker leather and more padding but tried to keep the fit good. He showed me bruises and abrasions from crashing and challenged me to do something about it. “But the real international presence of Dainese was down to Barry Sheene. He was the world champion at the time, the Valentino Rossi of his day. “Racing has been crucial to Dainese in terms of improving the ergonomics and protection levels of our products. All the protective solutions have come about as a direct result of racers’ inputs. If you want, you can buy a suit exactly the same as Rossi’s, with kangaroo skin, D-Air bag, all the same protection. You can even have it made-to-measure, just like Valentino does. “In some ways, making a textile suit for a road user is easier than making a leather suit for Valentino Rossi. But we need to know our products work at MotoGP level because it’s the most extreme environment and the ultimate testing ground. “A few years ago we started talking to the FIM about making air-bags compulsory in MotoGP and the FIM agreed. We decided to make our technology available even to manufacturers who don’t have air-bag systems because it was not fair that only certain riders should be fully protected. So what’s next for safety garments? “Air is the future of protection,” Lino tells MCN. “First we set it up in the motorcycle world with the D-Air system and then we transferred it to other sports, like skiing. But now we want to make it affordable for everyone, such as young kids who ride scooters, so we need to improve in terms of weight and costs. We then want to apply air-bag protection to activities outside of sport. I’m fascinated by air and what it can do. It has no weight but it can save lives. "I’m also interested in the use of air to help rehabilitate patients who have lost movement in their limbs. Compressed air can help with ‘micro-movements’ so I am very interested in this. We don’t know how to do this yet but everything starts with an idea. When we came up with the D-Air idea in 1994 we didn’t know how to actually make it work, but we did. “I spend most of my time in the D-Air lab now. I sold Dainese SPA in order to have more time and more budget to work in this lab (Lino retains a 20% share in Dainese). "We develop airbag systems for old people to prevent them breaking bones in falls, for children’s transport (child seats and airbags for cars) for epileptic patients who can cause a lot of injuries during a seizure, and for all kinds of people in the workplace. The advances we made for motorcyclists can be extremely useful for all sorts of other people in everyday life, too, and that is what the D-Air lab is all about.